A smoking slip is having a puff or more after you quit, but getting back on track. Most “slips” occur within the first week of quitting smoking. If you slip it does not mean that you will start smoking again having a full-blown relapse. Many people do relapse after a slip, so it is important to remember not to “allow” yourself a slip because you think you can stop after one or two puffs. Review your list of reasons to quit. Remember past situations in which you showed strength and acknowledge that you have come far. Recognize the slip as a brief return to an old behavior, an action that should be seen as a warning sign that can turn into a smoking relapse. With a new effort you can stop the slip and stay on track. Slips are not signs of failure. Don’t give up on your efforts to quit. Discuss with your support people, such as a family member, another person who has quit, or your doctor. Cigarettes should not be easily available. Don’t buy a pack. Don’t go places where it is easy to purchase a pack. A relapse is going back to smoking in a regular way. Strong desires to smoke can come about months or even years after you’ve quit. Often, these unexpected urges can be the most dangerous. But there is always a triggering event or circumstance that creates craving and ultimately relapse. Don’t give up. Set a new quit date, maybe in a week or so. Stay positive. You’re learning how to quit cigarettes. Remember, you’ll be prepared next time because you’ll know what to look out for. Get support- use your support network of family or friends, coworkers, family doctor, or health care professionals. Continue using coping strategies to keep you on track. - As these triggers occur, and you don’t smoke, the urges will become weaker and go away over time. 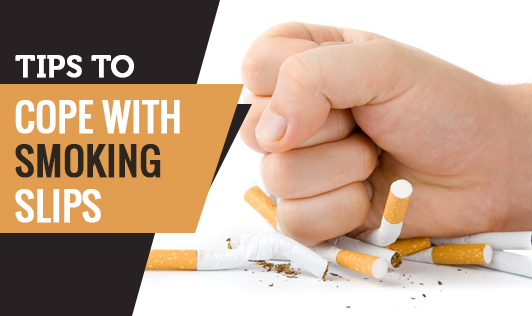 Smoking to deal with stress never solves the problem that caused you to return to smoking in the first place and only gives you one more reason to feel bad. Lastly don’t be discouraged, remember, most people try several times before they finally quit. Treat your relapse as a learning experience that you can use later. Every effort to quit moves you closer to success.